Kashmir is one of the dream destinations in the world, which fascinates the tourists coming here to explore and experience its hospitality. 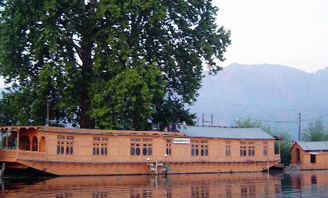 The Houseboats in Kashmir are not only competitive but also luxurious and comfortable in all respects, satiating the tourists at the end of the day. And that is where we come in the scene. Located on the Nigeeen Lake, the world famous "New Buckingham Palace" houseboat is designed and appointed to satisfy the most elegant and extravagant tastes in luxury lifestyles. One of the finest luxury houseboats in Srinagar, we offer the ideal and the perfect blend of convenience and efficiency to our guests from holiday makers to business travelers. The houseboats offer luxuriously decorated rooms replete with modern amenities like attached baths, running hot and cold water, cable TV, headted during winter season and round the clock room service. The houseboats have own traditional appeal. The houseboats is anchored on the nigeen lake fully furnished has an attendant boy. 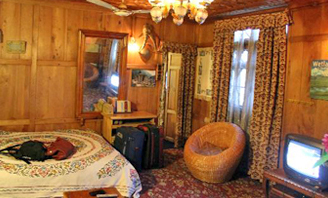 The houseboat is furnished in a grand style, with carved furniture and kashmiri carpets with intricate work on them. There are spacious three-bedrooms, three all feature attached bathrooms, electricity, power back-up round the clock and modern plumbing. The cedar interiors are intricately carved and display the consummate artistry of Kashmiri craftsmen. The furnishings include embroidered native rugs and fabrics, local objects d'art, and solidly comfortable Victorian and Edwardian furniture. The houseboat also feature rooftop sundecks from which to take in the himalayan views enjoy the brisk fresh air. A welcome to the hospitality of four generations of houseboating expertise.Chnages and improvements over these generations have equipped us to provide our guests with modern amenities in our rooms and suites. New beautifully furnished guest rooms feature comfortable beds and the most spacious floor plans. Our rooms are well-suited to meet the needs of business and leisure travelers.